nikakihijau: Google Nexus 5 technical specs has been leaked? Hi guys. 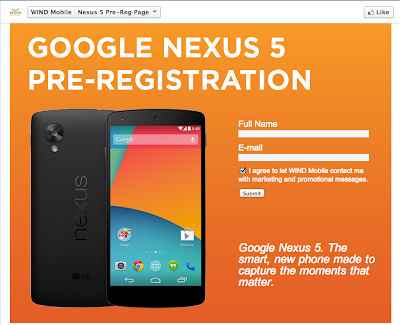 I just received an intel saying that Canadian Mobile Carrier Wind Mobile has today launched pre-registration page for the upcoming Android flagship, describing it as “the smart, new phone made to capture the moments that matter” at its facebook page. 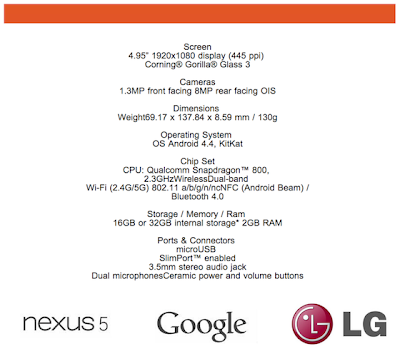 The page also reveals some key specifications for the latest Android flagship. Please browse my previous post as I have described the technical specifications. For your info, this Nexus will be Powered by LG. The best thing is that LG has built the phone’s power and volume buttons out of ceramic. The price? I reckoned it will be around USD 340+ depending on the carrier.